You’re wrapped in a blanket, looking at the soft snowfall outside your window. A roaring fire blazes in the fireplace, and your favorite mug rests in your hands, filled with hot cocoa. Your partner rests beside you on the couch, reading a book, and you wonder how life could get any better. What you’re experiencing, these feelings of contentment, of ease and peace with the world; these are the feelings that will get you through the coldest winter months. 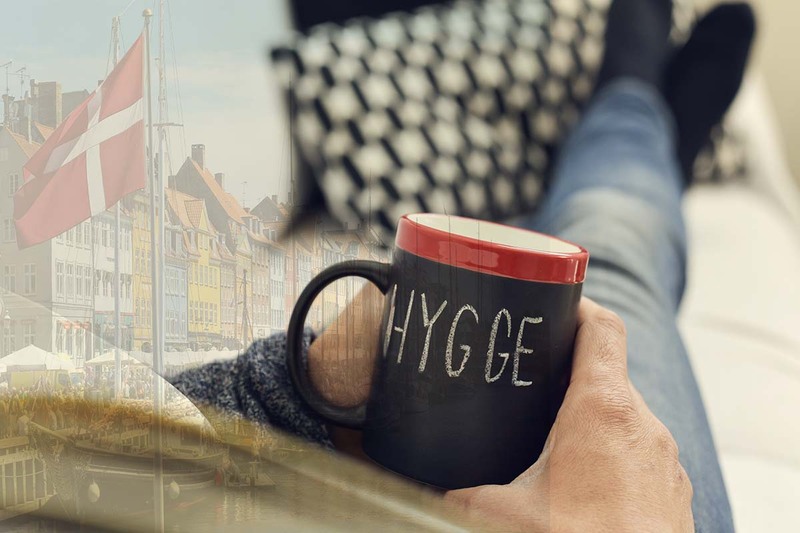 They are the feelings that embody the Danish concept of hygge (pronounced HOO-Gah); there’s no one direct translation of the word, but it derives from a word meaning well-being. Comfort is the key here, in it’s most unpretentious form. Having your best friend over to watch Netflix in pyjamas is hygge, and so is a quiet afternoon spent reading with loved ones. This means every person’s exact “version” of hygge will differ, depending on what gives you the most comfort. Togetherness is of particular importance, as feelings of familiarity definitely create comfort. Given that hygge was developed in a frosty clime (the Danes have cold weather to match our own, no doubt), it’s not really about going out; you’ve got to stay in and stay cozy in the winter months, after all. Food is another important part of the whole feel; cooking something warm, filling and nap-inducing is right where you want to be. Food Network Canada created a list of 20 hygge recipes for you to try out, many of them with their roots in Danish culture. Have people over to enjoy the meal, but don’t fret too terribly much over little mistakes; a stressed-out host is definitely not hygge. Comfort foods like mac ‘n’ cheese, chicken soup and stew are excellent choices to create the vibe; the smell alone will bring people to a state of bliss. Aroma is actually of particular importance to the concept; even writing about aromatic candles and fireplaces has my memory firing up, flooding me with feelings of comfortable bliss. While feelings of comfort are often found inside, getting out in the wintertime can be hygge too. Remember all the times you’ve spent building snowmen with your family, the crunch of the freshly fallen snow beneath your boots, the gentle rocking of a horse-drawn cart and the heat from your rosy cheeks after a long, slow walk through the woods with your friends. These things are all hygge, because they make you feel in love with the world. Buy Accutane online from HowMed http://howmed.net/accutane-isotretinoin/ by canadian licensed pharmacies. Hygge is all about vibe, not material things, so you don’t have to splurge to make your home comfy. Handmade pillows and blankets are particularly hygge, because they carry with them the memories of those who made them. You may be living in a place that’s not so hygge right now; for whatever reason, you might not feel the space is suited to bringing you comfort. If that’s the case, and you’re looking for new apartments, you should find a spot that you can really make your own; one where you can have friends over and enjoy each other’s company over a hot pot of coffee. Friends and family spending time together; that’s hygge.